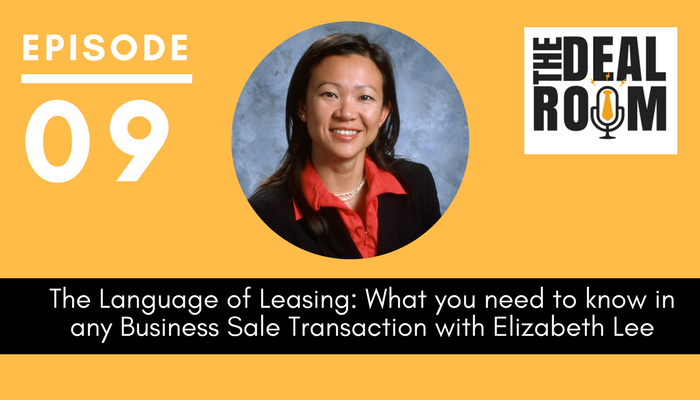 In this episode of The Deal Room Podcast, Elizabeth Lee joins us again as we talk about another exciting area of the business purchase or sale process. Today, we talk about one of the most fundamental areas which is property leases, why it’s important to check on property leases and the key considerations from a buyer and a seller’s perspective. 01:20 Why is property lease important? 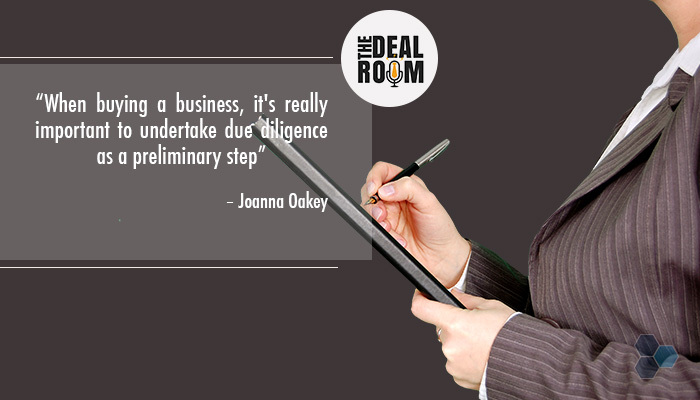 Joanna: Hi, it’s Joanna Oakey here, and welcome back to The Deal Room podcast. Today, we’re talking to Elizabeth Lee from Aspect Legal, our commercial legal practice. Joanna: So Liz is a commercial lawyer with an MBA degree who’s advised businesses for over 23 years. She’s also worked as in-house counsel at a large accounting firm prior to joining us here at aspect legal, and now heads up our contract law and business sale and purchase divisions. So I wanted her to come on board to The Deal Room today to bring her wealth of experience in talking about the area of property leases in sale and purchase transactions. Thanks so much for coming on to talk here today Liz. Liz: Thanks for having me, Jo. Joanna: Great. Well I think we should probably kick this off by talking about why this topic is important to our listeners. So, what’s so relevant about property leases for our listeners in sale and purchase transactions. Why is a property lease important? Liz: Well, a property lease is probably a fundamental contract that every business has. Every business will undoubtedly have a lease in place and in the area of property leases, it’s quite technical in that, we’re dealing with land and therefore in order to have an interest in land, a lease of a minimum of three years would need to be registered. And if you don’t register the lease, well really, the business doesn’t have a legal interest in the property. Joanna: Yeah. And I guess this is so important isn’t it, for businesses that have some benefit in the location that they are situated in. Whether or not that’s passing traffic that’s used to seeing that business and then forms a fundamental part of the goodwill and the value in that business moving forward, or whether or not I guess sometimes it can just be stability. Stability for where employees are used to coming, where clients and customers of the business are used to coming. I guess that’s really why it forms that fundamental, important element for many business sale transactions. 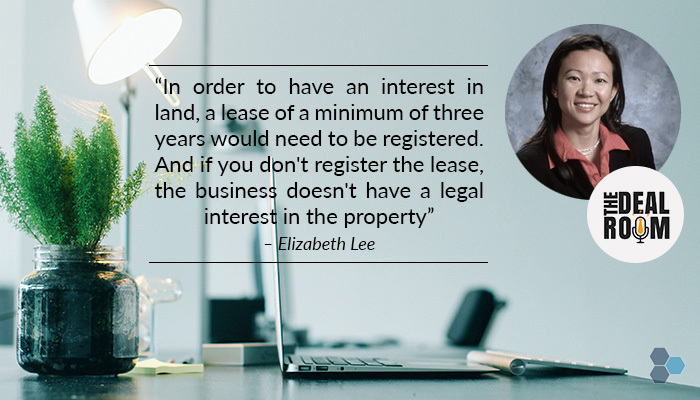 And sometimes it’s not appropriate in all business sale transactions but certainly, in transactions that we deal with Liz we see premises being quite often a really important key to part of the underlying value of the business the purchaser’s buying. Liz: Yes, correct. It’s rare that we are involved in a sale and purchase transaction where the property is not required. Joanna: Yeah, absolutely. Okay, all right. There’s two elements here aren’t there. There’s property in leases both from the buyer’s perspective and from the seller’s perspective. But maybe we’ll get off with talking about the buyer’s perspective because often that’s where the most troubles can arise. Maybe if you can give our listeners a bit of an overview of what the sorts of things are to consider when buying a business in relation to leases. Liz: Well when you’re buying, I think it’s really important to undertake due diligence as a preliminary step. You want to check that the lease is registered, particularly if the lease is at least three years old. Because if it’s more than three years old and it’s not registered then, you know you really just have an equitable interest in it which is not legally enforceable or may not be legally enforceable. Joanna: And we’ve seen that a few times in interesting cases where buyers have come in to us and it’s become apparent after we’ve started that, there are issues sitting there for the vendor, and potentially the purchaser, if they were to continue in failing to register a lease. Joanna: I guess when that happens and people are engaging in leases, often the concept of signing the contract seems like the most important thing but it’s actually this concept of registration that if forgotten, can be fundamental, right? Liz: Yes, correct. I mean we acted for a purchaser some time ago, and it wasn’t until after they came to see us that the purchaser found out that the lease hadn’t been registered. And in fact, that highlights the importance of doing due diligence because we then had to go back to the vendor to let them know that the lease isn’t registered and when the vendor solicitor investigated further, it turned out that the original lease that had been signed, not only had it not been registered, it could not be located. That really held up the process for the vendor in selling the vendor’s business. And we really want to try and avoid that situation from arising. Joanna: Yeah, absolutely. And even though we’re talking about purchases here, I think that’s such a critical point for vendors, in preparing their business for sale. It’s ensuring that they have all of their ducks in a row, lined up, things like checking that their lease is registered to ensure that they don’t slow down the sale process or indeed risk losing a buyer because they look unorganised. Joanna: Alright so, what are some of the other things that our listeners should be thinking about in terms of due diligence in property leases when they’re buying a business. Liz: Well they should be checking the commercial details that’s shown in the lease and that they’ve matched the financial records that they’ve sent. So for example, the rent hasn’t been understated in the financial records, and also, they want to be checking that there are no unusual financial covenants in the lease such as a big rent hike that might occur in six months’ time after completion. So it’s really important to make sure you get the lease properly checked out, so that you know what the long term obligation is. And of course a lease is a long term contractual obligation. They often run from three to five years if not more. So it’s really important to get that checked out. Joanna: Yeah. And I think sometimes, buyers can be quite emotional when they finally find a business that they think is really worth purchasing and they go through the initial phase of coming up with commercial terms for the business. Often things like property leases are thought to be an extra detail that don’t need to be reviewed thoroughly. But some of these areas that you’ve talked about could in fact lead to serious financial issues and implications moving forward, if they’re not detailed enough or if they don’t have the right advisers looking out for in an unemotional way for some of these issues. Joanna: Alright. Great. Okay so that’s the due diligence side. What are the other areas that are important for buyers to understand in relation to the lease? Liz: From a commercial perspective, I think the buyer should undertake an assessment of how critical the premises are to the business, because it may not be the case that the buyer wants to take on the premises, even though most of the time a purchaser will take on the premises. But I think that from a business fundamental perspective, purchasers should put their mind down to it, whether or not taking over the lease is absolutely necessary. And if so, are there any provisions in the existing lease that they want to change because that is a perfect opportunity to try to make changes to suit them. Joanna: Yeah absolutely. Yeah, and it’s interesting that area of making changes, during that period of assignment, isn’t it? Because quite often, there’s an issue with the power position, the landlord has got someone hooked up to the lease, so sometimes it can be a matter of really having the right approach with the landlord. Trying to find a way in a situation where often there’s little legal reason for a landlord to need to agree to changes. We need to sometimes then resort to other ideas about how to provide reasoning for landlords as to why or why not they should be considering these changes moving forward. Joanna: And, I guess there’s also sometimes a timing issue for purchases in relation to the lease, if they leave it too long to start discussions with the landlord and get approval for the assignment to them. Then, I guess that can slow down the process. So one of the things for buyers I think also, is to ensure that they are armed with all of the information that landlords will want to see in terms of understanding the financial backing of them as a tenant moving forward. Liz: Yes, so I think that this is part of the initial due diligence process of when you’re checking through the lease, you want to know upfront what the process is for obtaining landlord consent, and being as prepared as possible before you pick up the phone and speak to the landlord or make an appointment to see the landlord. You want to package up what it is that you want upfront before you see the landlord. The key is to be prepared. Joanna: Yep, yep, absolutely. And, as we say, this all comes back to that concept that leases sometimes are more of an afterthought but it’s just really critical that if buyers want a transaction to move quickly which is often the case, we need to ensure that they have all of the information on their side and that they’ve started the discussions as quickly as possible to ensure that the process of assignment of the lease doesn’t slow down the transaction as a whole. Liz: Yes, that’s correct. And we often see that happen, that the lease process is the process that delays the completion of a transaction. Joanna: Yeah, absolutely. OK. So that’s the issues relating to a buyer’s perspective. What are some of the things that are considerations for vendors then before they’re looking to sell their business in relation to this concept of the lease. Liz: So before they put their business up for sale, they really should check that their lease is in order. So to give the early example we spoke about if the vendor had been more prepared and checked that the lease was in place, the transaction would not have delayed as much as it did. It reflects poorly I suppose on the vendor too. When they’re trying to sell the business, it starts to put doubts in purchaser’s minds, as to well, what else has been forgotten that relates to the business that might need to be fixed up in due course. Joanna: Absolutely. Are there any skeletons in the business if we take it over? I guess that’s a big fear for buyers in a purchase transaction. What sort of quality sits in the way that the business was conducted and how much risk might there be for me as a buyer in this business moving forward? And that can really impact not just the speed of the sale, but also the value of the sale as well, which we can see is sometimes whittled down during this due diligence process if issues like this start to arise. Joanna: Okay great. And then, are there any other things that sellers should think about before they come to the point of sale? Liz: One thing that they do need to consider is, to make sure that if they’ve given any personal guarantees, that they’re properly discharged on assignment. Joanna: Yep, that’s a really critical one. Because those personal guarantees are often connected not just to the business that’s selling its entity, but the directors themselves personally. So it becomes even more critical. Joanna: Okay great. All right, well look, I think we’ve covered some really important issues then today, we’ve essentially talked about when buying a business you really need to think of the lease and issues relating to the lease, as one of the critical issues that you’re considering that contribute to the value of the business. So you need to make sure, you do proper due diligence, that the lease has terms that you are happy to move on with in the future. So say for example, make good clauses, are a good example of the sorts of clauses that might be lurking there that might create cost for you in the future if you’re not looking out for these issues. And, you need to make sure you understand the assignment process, and that you get started on providing your financials and anything that a landlord might require early in the process so that we’re not slowing down the sale process. Then on the flip side, our action points if you’re looking to sell your business is before you put the business on the market you need to ensure that your lease is in order, that it’s current, that it’s registered and that you have the right term in the lease moving forward. So, if possible that you have options available for the new buyers to be able to exercise into the future to get the most value out of the period of the lease as possible, and you need to also ensure that as part of the sale process you extinguish all of your personal guarantees. Great. Alright, well I think that’s a fabulous overview of the topic of leases in the area of business sale and purchase transactions today. Thanks a lot for coming along, Liz. Liz: Thank you, for having me Jo. Joanna: Great. If you like what you’d heard today, please head along to our website to find out more information or if you’d like information on how our lawyers at Aspect Legal can assist you with any of the items that we covered today then just head over to https://www.aspectlegal.com.au. And finally, if you enjoyed what you heard today, please pop over to iTunes and leave us a review. Thanks again for listening in, see you next time.